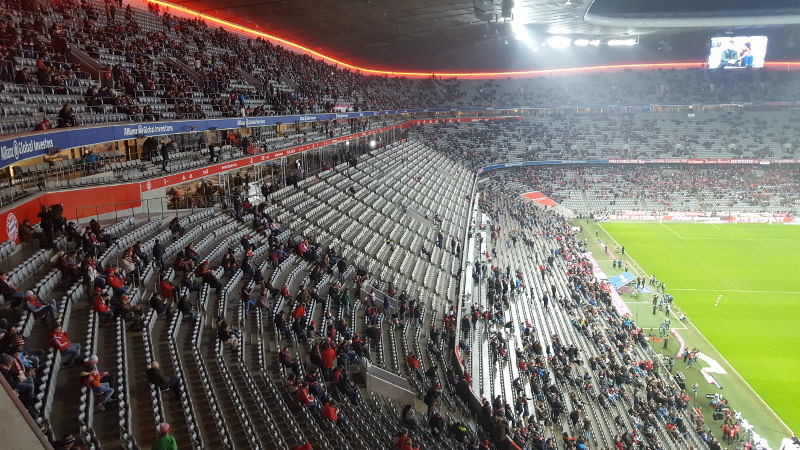 The Allianz Arena replaced Munich’s old Olympiastadion. 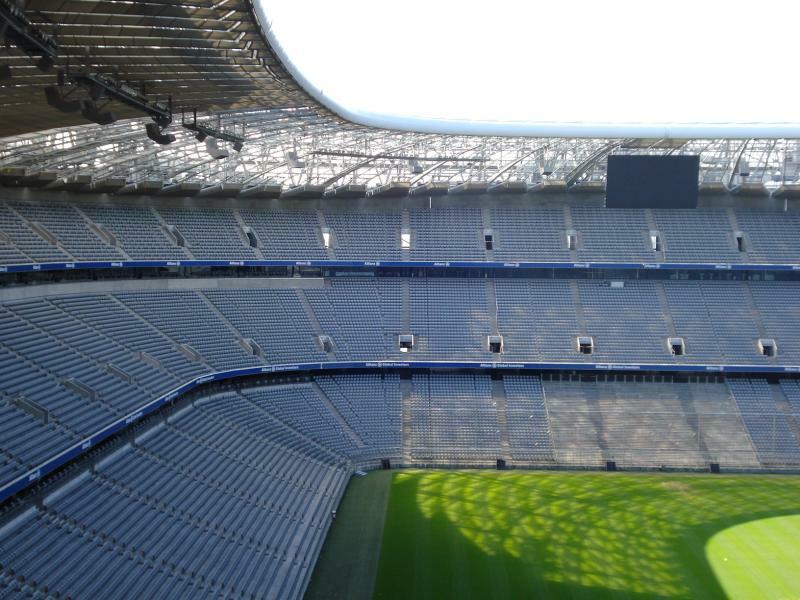 First plans for a new stadium were made in 1997, and even though the city of Munich initially preferred reconstructing the Olympiastadion, they eventually went ahead with the clubs’ proposal for an entire new stadium. 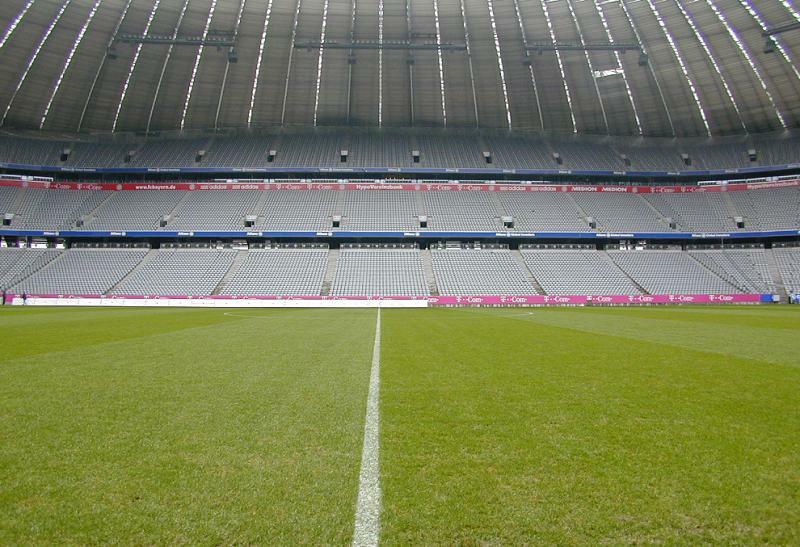 Construction of the Allianz Arena started in October 2002, with a total investment in the project of €340 million. The first match at the stadium, between TSV 1860 and 1. FC Nürnberg (3-2), was played on the 30th of May 2005. One day later Bayern played a friendly against the German national team (4-2). 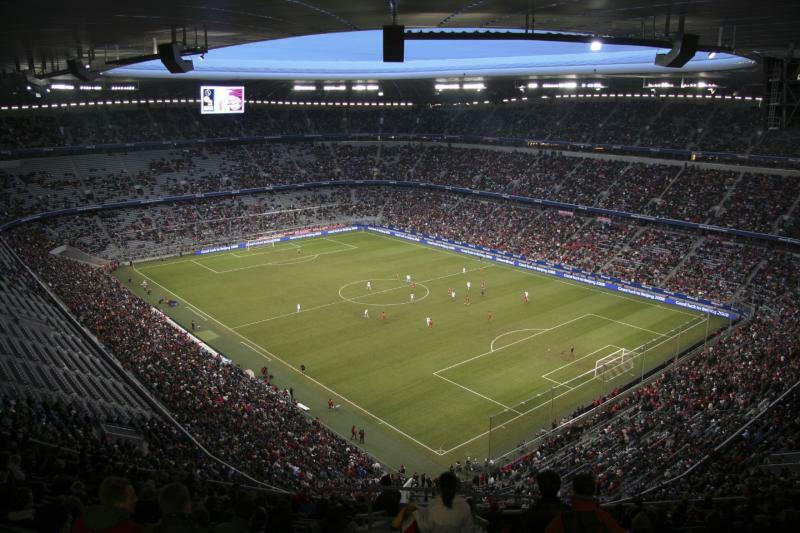 The Allianz Arena was one of the playing venues of the 2006 World Cup. During the tournament it hosted, among others, the opening match between Germany and Costa Rica (4-2) and the semi-final between France and Portugal (1-0). 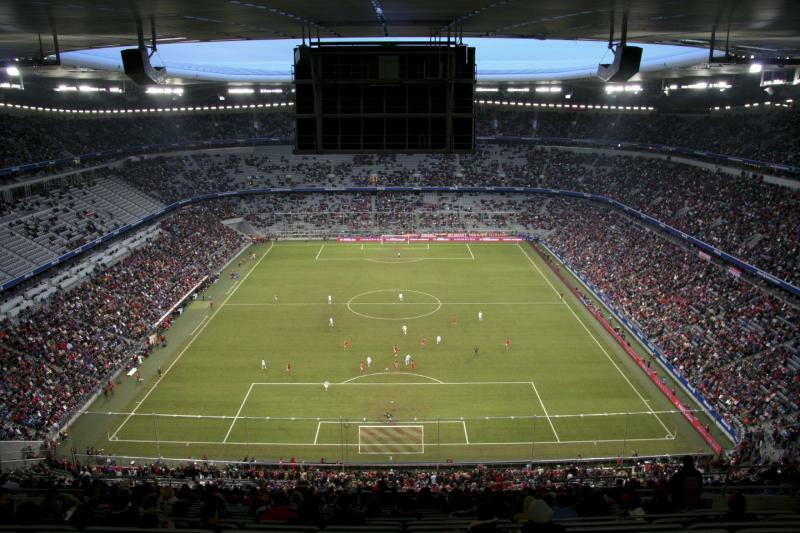 In 2012, the Allianz Arena was the host of the Champions League final between Chelsea and Bayern (1-1). In recent years, the arena was first expanded with an additional 3,000 seats and then by another 6,000 seats, mainly by creating extra space at the top of the upper tier and implementing optimisations to the stands. 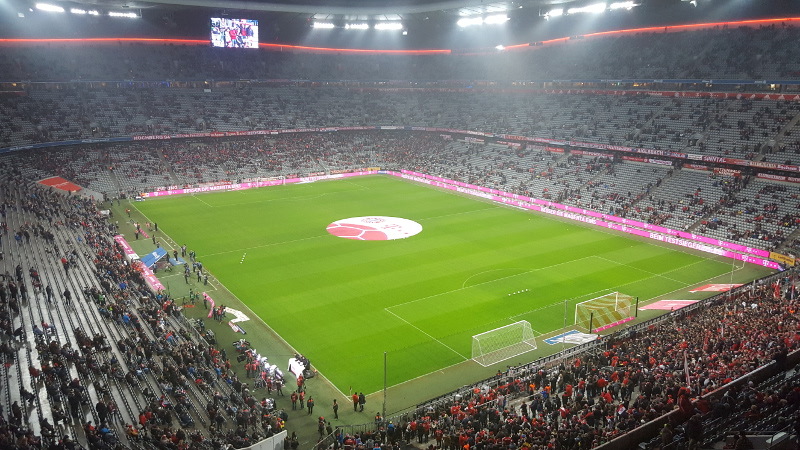 While the Allianz Arena soon turned out to be too small for Bayern, TSV found it more difficult to fill the arena, and struggled with the high rental costs. In 2006, they sold their stake in the arena to Bayern and went on to agree a lease contract. However, they never felt completely at home and in 2017 decided to move back to Grunwalder Stadion, which had been their home until 1995. 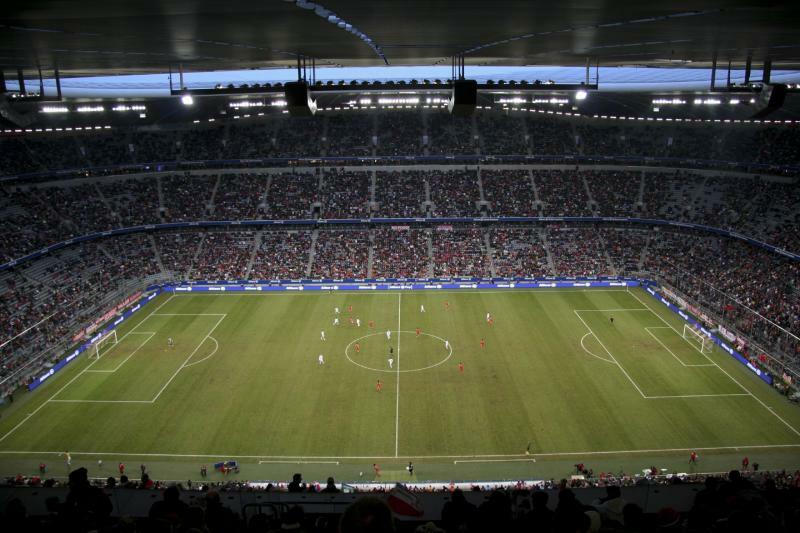 The Allianz Arena will be one of the playing venues of the Euro 2020 tournament, hosting three group matches and one quarter-final. 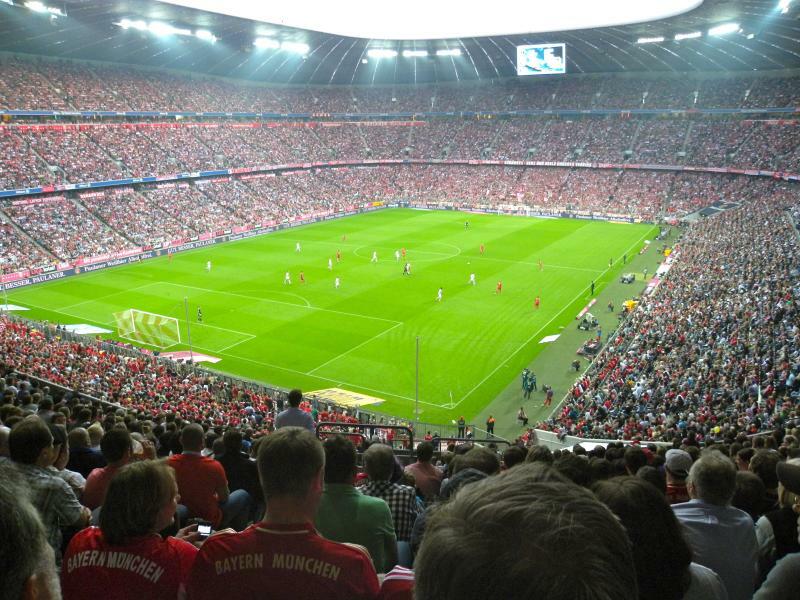 The Allianz Arena is located on the northern edge of Munich, about 10 kilometres from the city centre. The stadium lies almost adjacent to both the A9 and A99 motorway. If coming from the A9, take exit 73 München-Fröttmaning-Süd. If arriving from the A99 west, take exit 12b München-Fröttmaning-Nord. If using public transport, the Allianz Arena is easily reached by metro. Take line 6 in the direction of Garching-Hochbrück and get off at stop Fröttmaning. You can catch line 6 right in Munich’s old city centre at stop Marienplatz. The journey takes about 15 minutes. There are tram connections from both Munich’s large train stations (Hauptbahnhof and Ostbahnhof) to Marienplatz. The Allianz Arena is located on the edge of the city and is bordered by an office and retail park. 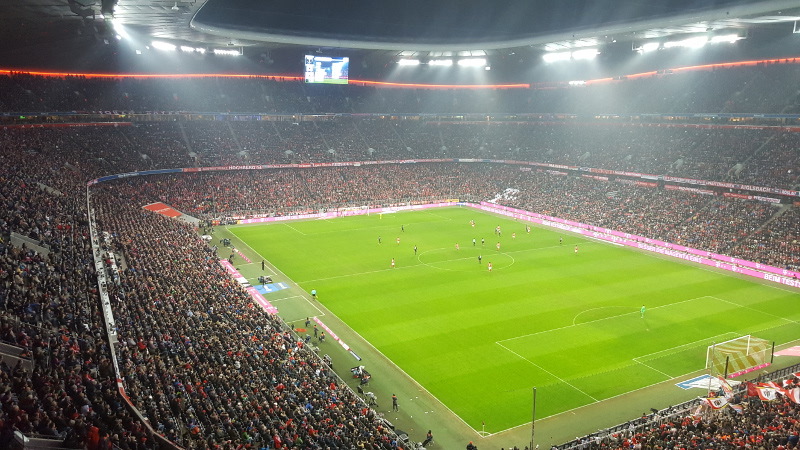 There is little entertainment around, and you are better off eating and drinking in Munich’s city centre and to just head to the arena to see the match. There are few hotels in the immediate surroundings of the Allianz Arena. If you are coming in by car and need something close to the arena, then there are a few road-side hotels one metro stop north of the stadium (in Garching-Hochbrück). Both Motel One and Ibis Hotel München Hochbrück are decently priced and get good reviews. Hotel Coro is a nearby alternative. Hotel Arena Stadt München is located one metro stop south of the stadium and theoretically at walking distance. 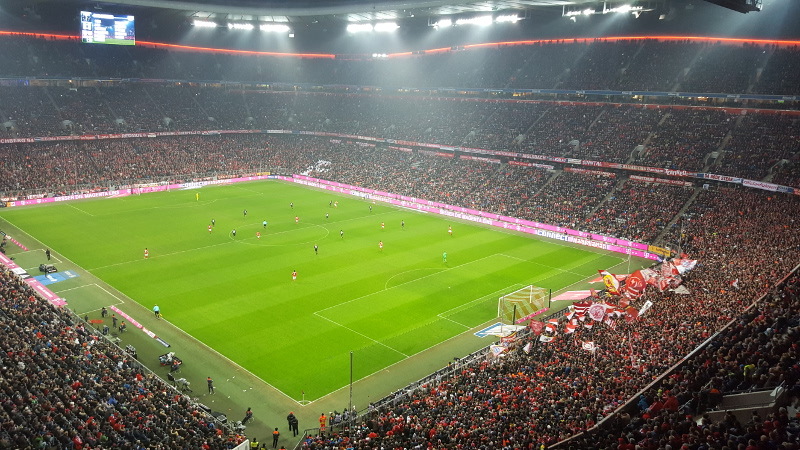 Click here for an overview of all hotels near the Allianz Arena. There are obviously also plenty of hotels in Munich’s city centre, in particular in the area around Munich’s main railway station. You can buy tickets for Bayern games online, or in person at the Bayern ServiceCenter at the Säbener Straße 51-57 (in the south of the city). 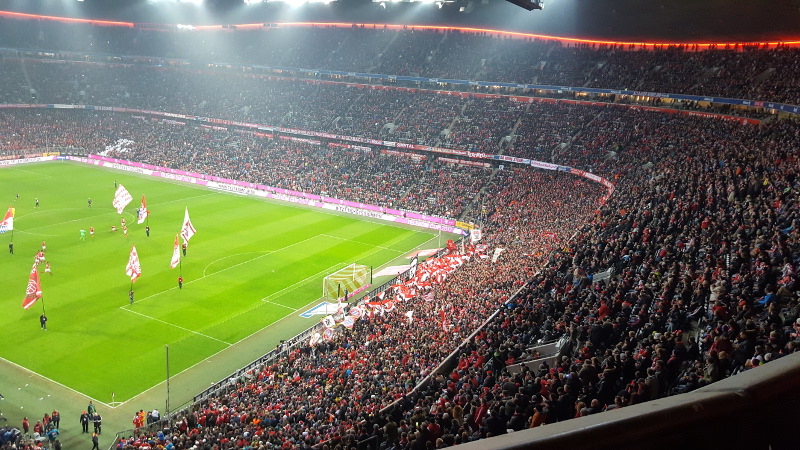 However, Bayern sell out every home league match and it is nearly impossible for non-members to get tickets, even in advance (though Bayern’s own ticket market place may at times have some tickets available). While viagogo is no longer the official ticket marketplace of Bayern, they do offer a reliable choice of tickets, albeit for premium prices. Tickets range in price from €35.00 for a seat at the upper tier behind the goal to €70.00 for most seats at the sides. Tickets for the standing areas behind the goals go for €15.00. For more information call +49 (0) 89 699 31 333 or email tickets@fcb.de. Visitors can book a combi-tour which includes a guided stadium tour and a visit to Bayern’s club museum (Bayern Erlebniswelt). The 60-minute tour includes among others the stands, changing rooms, players’ tunnel, sponsor lounge, and press club. Tours run every day of the week at regular intervals during the opening ours from 10:00 am to 6:00 pm (in German as well as English). There are no regular tours on the day of a match but ticket holders can book special matchday tours for €49.00. Bookings can be made online, but are not required as a ticket can be bought before the start of the tour at the foyer of Bayern Erlebniswelt. The arena advises to book in advance though to avoid having to wait on busy days. The combi-tour costs €19.00. For more information call +49 (0) 89 69931-222. FCBayern.de – Official website of FC Bayern. 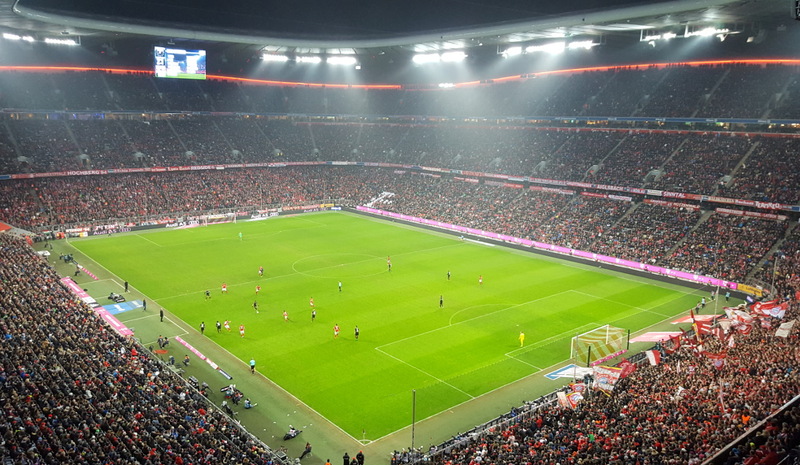 Allianz-Arena.de – Official website of the Allianz Arena. Muenchen.de – Official website for the city of Munich. MVV-Muenchen.de – Public transport information and journey planner for the Munich area. I went to watch a DFB Pokal(German cup) game against Braunschweig. Atmosphere was great! Stadium itself is amazing. I bought my ticket on viagogo and it arrived two weeks before the game. Reaching Allianz Arena is very easy with undeground system. Recommended! In a word: stunning. 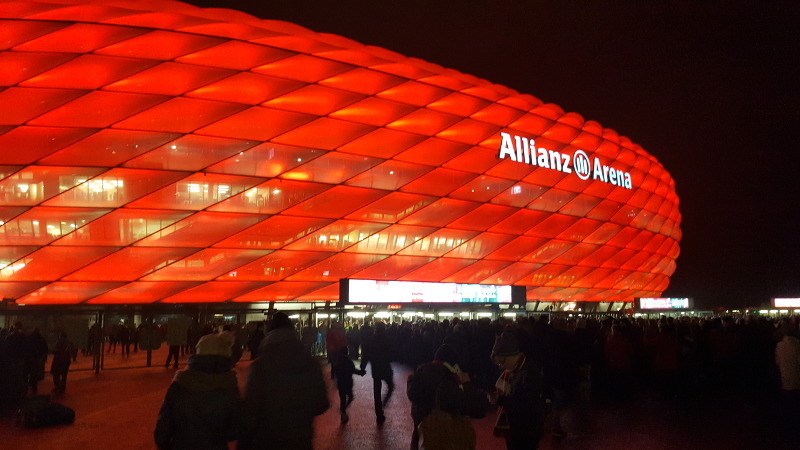 As impressive as the Allianz Arena is on television, seeing it in person is breath-taking. If ever there was a monument to sport, the Allianz Arena is it. I’ve had the good fortune to visit twice, and both times I’ve been stunned by the sheer dimension and the quality of its infrastructure. The tour is worth every cent, and then some. 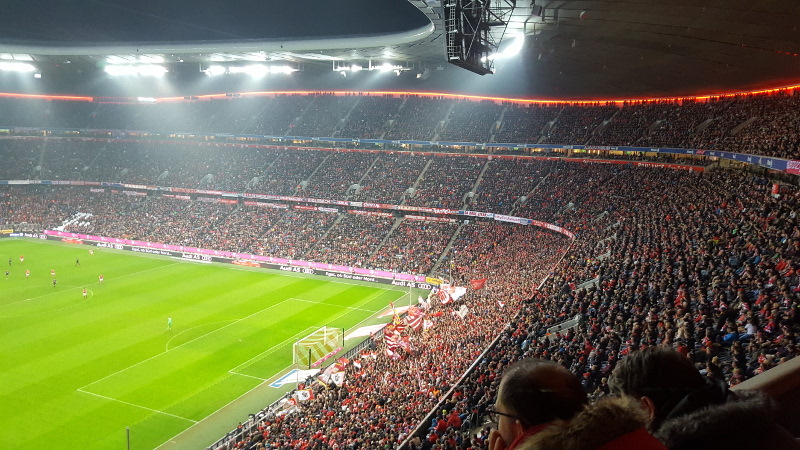 If you’re a football fan, and ever find yourself in Munich, treat yourself to a visit for an 1860 match or (if you’re lucky enough to find tickets) Bayern Munich. It’s an experience you won’t soon forget!